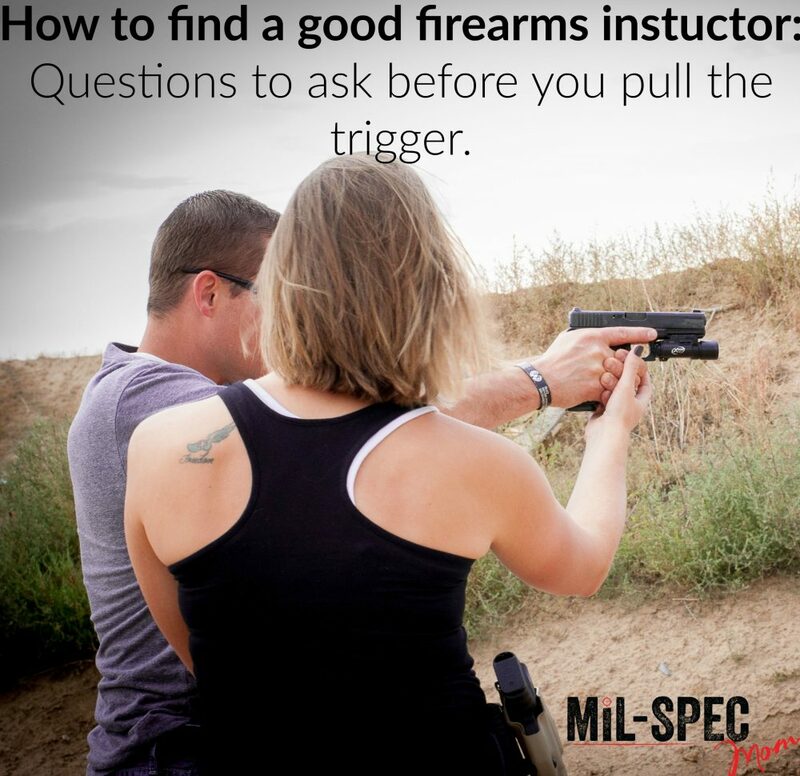 How to find a good firearms instructor: This can be a daunting task! If you live in a place like mine, firearms instructors are a dime a dozen. Some are fantastic, and some shouldn’t be instructors at all. Then there are all the companies in between. How do we know which are which, though? It took me a very long time to be able to see a good instructor compared to a bad one! Beyond the good and bad, you need to take into account what it is that you’re looking for! If you want to be the next SEAL Team 6 guy, then that will be your focus in finding an instructor. If you just want your concealed carry permit but never plan on actually carrying your firearm concealed, then your focus will be much different! One good way to figure this out is to look at their marketing. Each company markets to a certain demographic. If you find out who they market to you can figure out the focus of their curriculum. Don’t be afraid to ask questions. These instructors and companies are going to give you the skills that are vital to the success and survival of your family. There has to be a level of trust and knowledge there. Not only do you have to be comfortable with them, but you must be confident that they can give you the training that you desire. A good way to get a decent picture of their training are reviews from past clients. You can find these on Google, the Better Business Bureau website, and their Facebook business page. Normally, people who leave reviews were either extremely pleased by their experience or extremely displeased by it. So, unfortunately, you get the two extreme views, but with those extreme views you can find a happy medium and get a fairly well-rounded view of the company. The thing is, if you find a worthwhile company, you will inevitably take more than one course. Assuming you start by getting your concealed carry, you want to (and should) progress with your training. You will be investing your money into this company with the hopes of gaining the knowledge you need to defend yourself. So, finding someone worthy of your money and time is vital. What’s the focus of their curriculum?If you’re the person that wants to be on SEAL Team 6 then you should find a company or instructor that teaches that! You need to ask questions about what they teach and WHY! Do an interview of the company. You will be paying them for their services, they should teach what you want to learn. If they don’t, then move onto another company or set up a private training session so you can get the instruction that you want. Remember, he who pays makes a lot of the rules. If you are looking for a company that does a good job at teaching concealed carry, then that’s what you should ask. If a company charges significantly more for a private tutorial than a class, I would do more digging into whether that company was just after your money or actually had good training to offer. How do they carry in everyday life and at the range? This is important. How an instructor carries his or her firearm on the range, and in eery day life, will tell you a multitude of things. For example, if your instructor open carries, you need to move onto another company (Check out THIS LINK for a YouTube video on open vs. concealed carry). Granted, this is a personal, albeit professional, bias against open carry in public, but it’s just not smart nor is it to your tactical advantage. If the instructor open carries and/or uses a shoulder holster. Just RUN! There are very, very limited times and places for a shoulder holster. Teaching a concealed carry course or for an everyday carry setup is NOT one of them. It screams bad tactics and poor instruction. It also says that there is a lack of experience and training on the instructors part. Does the class even go to the range? There are many firearms companies, gun shows, and sports shows, around the area here that offer a concealed carry course that doesn’t mandate range time. This means that you take the concealed carry course, but never actually touch a gun! Not only is this all kinds of stupid, it’s also a hazard. It’s a hazard to them, as instructors, and their company. It’s also a hazard to you! You need the peace of mind, as a student, that you can handle the firearm in a critical stress situation. If a company doesn’t require range time, then it’s time to move onto a different company. They have found a loophole in the state laws and are using that loophole to make money without doing the hard part of the job. You need to practice the skills as you’re learning them. If you’re not comfortable then you won’t carry concealed. If you’re not going to carry concealed, then what’s the point of taking the class? You’ve just wasted your time and hard earned money. Frankly, it’s cocky and arrogant that an instructor thinks his or her power point is a good enough substitute for actually firing a gun. Do they teach more than one way to do something? You want to find an instructor and company that gives you multiple options. Granted, a good firearms instructor will show you his or her preferred way and explain why he likes it, but he or she has to be able to show you other options if that doesn’t work for you, your body, or your lifestyle. They could be shorting you the knowledge that might work better for you.You need all the information you can get, and you need to be given the ability to decide what works best for you. This also means that your instructor needs to know several different ways to accomplish the specific firearms drill or task. This leads beautifully into my next point. Where does their training come from? I’m probably going to step on some toes here. Sorry, not sorry. But, here’s why. If you aren’t fully trained, qualified, and over-qualified to teach me how to defend my family and kids, then you’re useless to me. A firearms instructor’s skill set directly affects my ability to protect and defend my kids. Make that connection there and make sure it stays. It is vital. Only being certified with the NRA isn’t enough. At the end of the day, the NRA is a political organization. Their standards are extremely slow for instructors, unfortunately, you have to be approved by them to be able to sign off on a concealed carry permit. Also, having only 4 years of the military isn’t enough. Liking guns isn’t enough. Being on a reality show isn’t enough. If their experience is taking ONE course from a famous name instructor like Haley Strategic, Costa Ludus, Larry Vickers, etc. it isn’t enough. They need to have a multi-faceted training history. Their training needs to come from a variety of places to ensure well-rounded instruction. It’s their history and experience that will allow my children to have a mother. You’d better be worth your weight in gold because my kids’ lives depend on it. Please vet your instructors and companies carefully. Your life depends on it. The lives of your family depend on it. Your legal use of deadly force depends on it. Subsequently, your peace of mind also depends on the skills that you learn from your instructor. The company you choose doesn’t need to reinvent the wheel. It’s already there, it already works. It’s been tried and tested by the lives of our service members. Military members, private contractors, and law enforcement use the brands, methods, and techniques because they’ve been vetted and they work. We use the term “instructor” because it’s an industry standard. However, consider this when you’re thinking about how to find a good firearms instructor: There is a difference between an instructor and a teacher. An instructor tells you how to do it and a teacher shows you how to do it and helps you while ensuring understanding, comprehension, and confidence.